This trans-disciplinary conference aims to explore a series of themes that emerge from the understanding of contemporary photography as the basic unit of visual communication of the age of technology: online, off-line and between the lines. 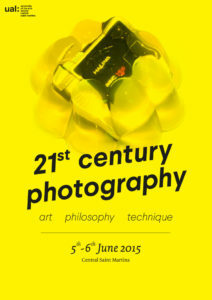 The aim is to bridge the gap between aesthetic, philosophical and technological approaches to the photographic image and to prompt participants from different backgrounds (fine art, critical theory, philosophy, software/hardware) to engage with each other and to open new avenues for the critical interrogation of the roles of images in contemporary culture. In the past decade, photography has gained momentum in public and private environments becoming one of the determining factors of contemporary life. The hyper-growth in various forms of digital imagery for screens provides a quintessential example. The triumph of the photographic image as the internally eloquent and profoundly apt expression of computational culture also provides a new philosophical lens upon which to investigate how representation affects norms of meaning-creation, and the ethical and political consequences of the acceptance of images as purveyors of truth. What is an image of thought?